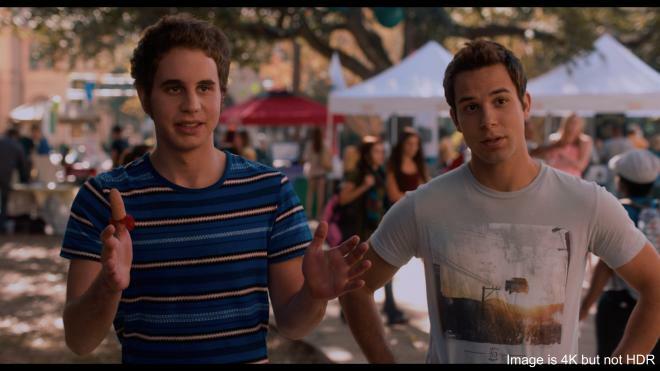 Pitch Perfect was the surprise sleeper hit of 2012 featuring what should be a silly concept on paper, but thanks to a talented production crew, the music comedy is wildly entertaining and better than it has any right to be. Debuting on the 4K Ultra HD stage, the Barden Bellas put on a great performance thanks to a strong HDR10 presentation and an amusing DTS:X soundtrack that'll have owners singing along. With the same set of bonus features as before, the overall package is Worth a Look for the most loyal fans. It's one thing to make a music comedy about the journey of an all-girl a cappella team competing to win a collegiate national, but it's another to actually turn such a puerile plot into a surprisingly good and wildly entertaining motion picture, which Pitch Perfect shockingly is. Frankly, the silly concept of a national competition determining the best-harmonized singing group feels better suited for a direct-to-video release or broadcasted on the Disney Channel. But miraculously, director Jason Moore, writer Kay Cannon, producer Elizabeth Banks and all of their creative partners defied expectations — and more importantly, any preconceived assumptions — with a rather traditional underdog story that follows a troupe of talented young ladies on the road to championship glory. In the words of our main protagonist Beca (Anna Kendrick), this is actually a thing. Basically, think the engaging drama of Rocky meets the winning absurdity of Dodgeball, only switch the thrill of playing the sport at the center of those movies with people singing cover songs minus the instruments. Loosely adapted from Mickey Rapkin's non-fiction book, this is an alternate universe where a fictitious university is home to not one, but several a cappella student clubs. Even more amazing, these non-credited activities are genuinely sought-after and desired by incoming freshmen who equate some of the members to near rock star status. A cleverly-constructed montage sequence reveals many gifted singers auditioning for a chance to join one of the clubs and later initiated where the story takes a short detour through the Animal House and Van Wilder campus before steering the tour bus back to the more familiar "odd couple" zone. As the uptight, strict, by-the-numbers leader of the Barden Bellas, Aubrey Posen (Anna Camp) strains to harmonize a troupe of misfits in order to redeem herself of an embarrassing performance while a reluctant, risk-taking, plays-by-her-own-rules Beca wrestles with staying true to herself while also playing nice with others. With a series of clever puns, gross-out gags and physical pratfalls, the music comedy is a surprisingly funny and heartfelt journey of discovering one's own unique voice. 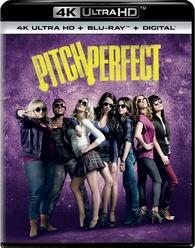 Universal Studios Home Entertainment brings Pitch Perfect to 4K Ultra HD Blu-ray as a two-disc combo pack with a flyer for a Digital HD Copy. When redeeming said code via UPHE.com, Movies Anywhere and VUDU, owners are only given access to the SD and HD SDR versions. The dual-layered UHD66 disc sits comfortably opposite a Region Free, BD50 disc inside a black, eco-elite case with a glossy, embossed slipcover. At startup, the disc goes straight to an interactive menu screen with full-motion clips and music playing in the background. The pitches take to the Ultra HD stage and put on a great show thanks to the harmonizing talents of an HEVC H.265 encode that brightens the screen with improved contrast and brightness levels. Overall, black levels are noticeably richer, providing the 1.85:1 with a lovely cinematic quality and appreciable depth. Shadow delineation is strong with excellent visibility in the darkest corners of the stage or the several, deliberately poorly-lit sequences. White levels are crisp and clean, making the stage lights radiate with vivid intensity. However, there are also many instances of blooming and a few hot spots, most notably during exterior daylight scenes where the sun shines off someone's forehead or shoulder with such severity that it washes some of the finer details. There are also a couple moments where I detected some very mild posterization in the faces of the cast or in the blue sky. Specular highlights appear somewhat affected by this, offering very little, if any, visible details within the whitest of whites. The most impressive aspect of this fierce competition is the colorful cinematography of Julio Macat, displaying a spirited, more enthusiastic array of primaries. The 4K presentation shows a nice variety of reds and blues in nearly everything from the clothing to random items in the background, and greens are full of life and energy. Secondary hues are also tad warmer, such as the glowing oranges of Beca's DJ software, but there isn't a great deal of variation, except during the a cappella national competition where viewers can enjoy some very vivid lavenders, hot pinks and rich currant reds in the many outfits. Only issue worth mentioning is that flesh tones come with a noticeably red push, making everyone look almost sunburnt or lightly tanned, which was often distracting. Coming from the same 2K digital intermediate used for the Blu-ray, overall resolution and detailing looks about the same as its HD SDR counterpart, but there are several moments where viewers can appreciate a notable uptick in definition. The Bellas take a risk and sing their hearts out with a DTS:X soundtrack that offers a few minor improvements but is ultimately not much different than its DTS-HD MA 5.1 counterpart. Much of the action and attention is maintained across the screen, displaying excellent balance and movement between the three front channels. A few off-screen effects travel to the top heights, opening the soundstage a bit more, but it's not particularly standout or noteworthy. In fact, the ceiling channels are relatively silent for a majority of the runtime, except during singing competitions when the cheers and applause of the audience nicely echo into the overheads, but the musical score and song selections are more effectively at expanding the soundfield and provide a couple immersive moments. Overall, the most appealing aspect is an extensive mid-range, exhibiting crystal-clear distinction between each note and retains excellent clarity in the loudest segments. More importantly, vocals are superb and precise, delivering outstanding separation and intonation in the many different voices. The low-end is hearty and surprisingly robust, providing great weight and depth to the music and in every performance. Featuring an ensemble cast of talented young actors and starring Anna Kendrick, Pitch Perfect is a hilarious series of clever puns, gross-out gags and physical pratfalls sure to amuse the whole family. The Bellas take to the Ultra HD stage with a great-looking 4K HDR10 presentation and a strong DTS:X soundtrack that'll have owners wanting to sing along. 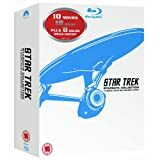 Porting over the same set of supplements as its Blu-ray counterpart, the overall package is arguably most tempting for loyal fans but worth a look for others.